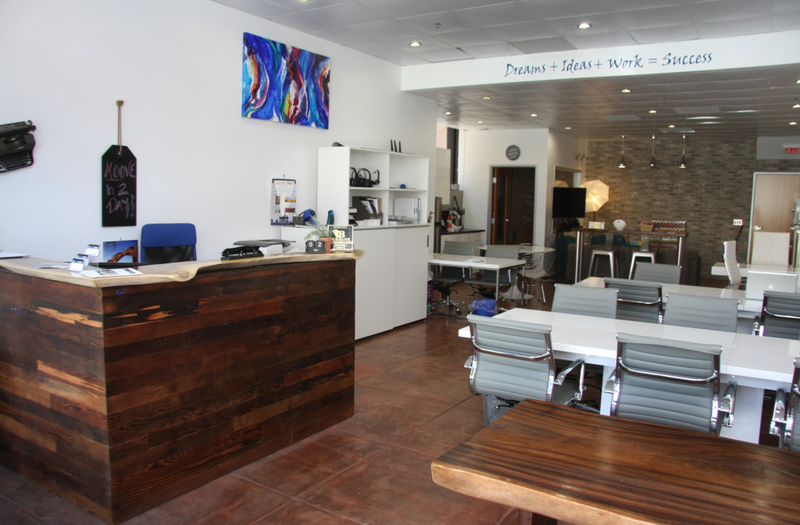 What makes MY OTHER OFFICE different from other coworking or shared office spaces? What are your coworking hours? Can I try it out coworking for free? How do I become a coworking member? How much coffee or snacks can I have? Can my guest access the wireless internet? My company depends on me having fast internet, how fast is the internet at MY OTHER OFFICE? Can I talk on my cell phone? Is there a private space to meet with clients? Do you have private offices for small companies (i.e. startups and small businesses)? Can I rent space for a private event? Do I get any benefit for referring people? Coworking is a “shared office” workspace that functions as a member club. Typically it is attractive to work-at-home professionals, independent contractors, small/startup businesses, and people who frequently travel who end up working in relative isolation. Coworking provides members with the opportunity to network with other highly-motivated self-starters from a variety of industries, escape the isolation of working from home or a hotel, while enjoying amenities like high-speed secure Wi-Fi, coffee, tea, water, and snacks along with business amenities like copying, scanning, printing, virtual mail handling, and meeting spaces. While there are a number of wonderful coworking places, MY OTHER OFFICE separates itself due to its location, wonderful facilities, outstanding staff, and amenities for members. Located in the heart of downtown Burbank, MY OTHER OFFICE is in a fantastic location that is easy to access via public transportation, surrounded by plenty of free public parking lots, and in easy walking distance to a variety of Burbank’s best restaurants and eateries. The facilities themselves are organized, clean, and decorated to promote free and clear thinking by our members and is conveniently located only fifteen minutes away from Burbank airport and within a five minute walk of many MetroLink stops. Our friendly staff is second-to-none in terms of customer service and customized offerings for our members. We pride ourselves on being able to fulfill office-related needs while providing a productive and casual atmosphere that promotes efficiency, networking, opportunities, and autonomy. What really ties the bow on what makes MY OTHER OFFICE a special coworking space is our amenities. In addition to all our standard offerings (i.e. high-speed secure Wi-Fi, coffee, tea, water, snacks, printing, scanning, faxing, copying). We also provide a private telephone booth and private skype room for members who need that brief period away from the Flex Floor to meet or talk in a more private setting. MY OTHER OFFICE is located in the heart of downtown Burbank at 124 East Olive Avenue between 1st Street and San Fernando Road. We are right around the corner from a variety of restaurants, shops, cafes, and many other attractions. We are only fifteen minutes away from the Burbank airport and mere minutes away from many stops along the MetroLink bus and train lines. We are open Monday – Friday from 8:30 am – 6:00 PM and will be opening soon on Saturdays from 9:00 am – 2:00 pm. We also offer private suites and “dedicated desk” spaces which are available to our members 24/7. Yes! We’d love to have you come by and see our space! You can call ahead to schedule an appointment (818-860-7500) or we’re perfectly fine with walk-ins; feel free to stop by at whatever time works best for you. Yes! You can sign up for a Free Day Pass. With the “Free Day Pass” you have access to the facilities and all the amenities that our regular members enjoy (i.e. free high-speed secure Wi-Fi, coffee, tea, water, snacks, candy, copying, printing, scanning, etc.). Via Bus: Our location can be easily accessed via the LA Metro Bus. Routes that have stops within two blocks of our location include: 92, 94, 96, 154, 164, 165, 183, 195, 292, and 794. Via Train: Our location can be easily accessed via the LA Metro Train. The Downtown Burbank/Metrolink Station is located only a 5 minute walk away from us and can be accessed via the Ventura County Line or Antelope Valley Line. Nearby Airports: We are within a fifteen minute drive from the Burbank Bob Hope Airport (BUR) and 45 minutes to an hour from Los Angeles International Airport (LAX). Membership at MY OTHER OFFICE (access to reduced rates of our conference rooms, general perks) is an annual fee of $25/year. Access to our Flex Floor Coworking Space can be acquired via a Day Pass ($25) or a Monthly Pass ($275/month). When breaking down the Monthly Pass ($275) via work days per month it averages out to about $12 – $13 per work day. For our non-monthly clients we also now offer a Day Pass Package where a client can buy eight Day Passes ($200) and receive a eighth & ninth for free ($250 value) (Until the end of August). A coworking Flex Floor Plan includes access to high-speed secure Wi-Fi, copying, scanning, printing, coffee, tea, water, snacks, access to private telephone/skype booths (first-come, first-serve for these amenities). In addition to these perks, as a member you receive discounted rates to use our conference room space and you will be notified of all new perks that MY OTHER OFFICE extends to the community at large. As much as you want! There are no limits on how many cups of coffee or snacks our members can have. This is your (shared) office space! Yes! If it is simply a client meeting for an hour or so you’re welcome to have clients come in as guests whenever you would like for free as long as they sign in. If you have employees or clients that will be in our space for 3+ hours in our space they will need to purchase a Flex Floor Day Pass. Yes! Your guest is our guest and MY OTHER OFFICE will grant them with the high-speed secure Wi-Fi connection information so they can connect as well! The internet is great! We have 100 megabyte per second download speed and 6 megabyte per second upload speed! Yes! Our Flex Floor Coworking Space is a perfectly acceptable place to take a phone call while being mindful of volume for your fellow co-workers. If you’re looking for more privacy you’re also welcome to use our private Phone Booth or Skype Booth. Yes! Here at MY OTHER OFFICE we offer Virtual Mail Services for purchase by the month or by the year! What does this do? It allows you to use our business address as YOUR business address! 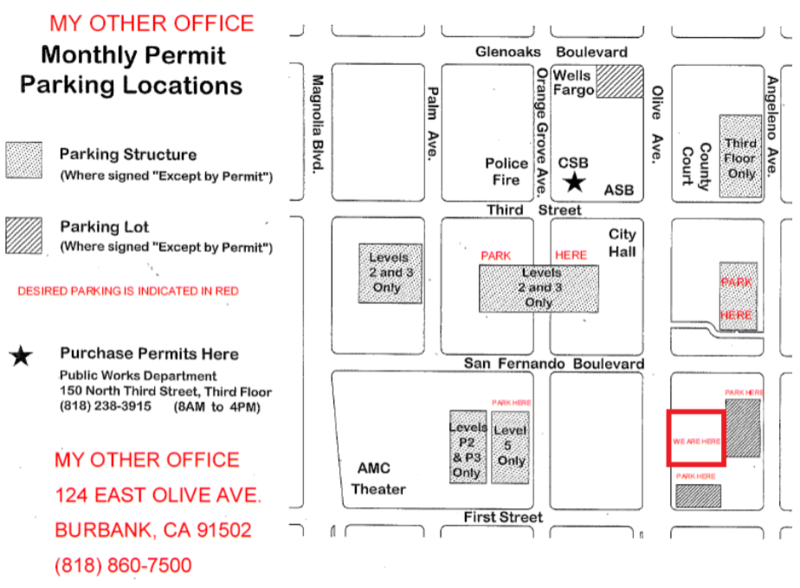 No “PO BOX”, no “Suite #X”, our address here at 124 East Olive Avenue in Burbank will be YOUR business address. Up to 2 Days/Month of Flex Floor Coworking Space time. Up to 1 hour/month of Conference Room meeting time. Yes! 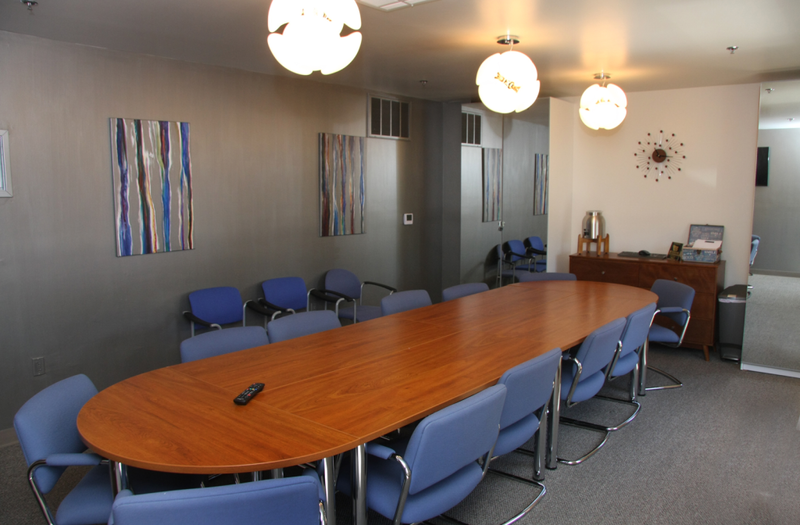 We have conference room space that can be rented by BOTH members and non-members as well as our Flex Floor Space! Each room comes equipped with white boards and other amenities. The Meeting Place on Olive is a flexible space that is designed for larger group meetings (good for large conference meetings, table reads, filming, etc.). It has a table for 12 people and comfortably holds 20. It can be rented for $55/hour by members and $65/hour for non-members (membership is an annual fee of just $25). The Flex Floor Event Space is designed for larger events and is a flexible space with many tables that can be moved or cleared out if needed. It is available in coworking off-hours by appointment. It can be rented starting at $100/hour, contact us for further details. Yes! Please contact us for our latest private suite space availabilities and rates. Yes! Our Flex Floor Event Space and Conference Room can be rented out for all kinds of private events! Please contact us and let us know what you’re looking for. Yes! We have a Referral Program that rewards our members when they refer a new member who signs up for the Flex Floor Coworking Space (Monthly Plan) or for Virtual Mail! Contact us for further details.